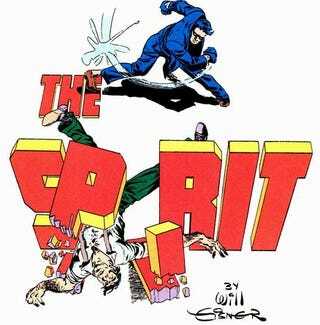 Most of the people eagerly awaiting the Frank Miller-ized movie of Will Eisner's amazing comic The Spirit have never actually read the original comic. So they probably don't have a sense for the difference between the comic and Miller's campy Sin City-esque vision for the film version. So as a public service, we're presenting the best 12 splash pages featuring Will Eisner's masked hero, to show once and for all why Miller can't hope to bring their genius to life. From the visuals we've seen so far, Miller's distinctive vision seems to have scrapped the rapidly switching genre for his own usual film noir feel, as you can see in the poster at left. The high profile of the Spirit's female paramours also marks a shift from the original comic. There's also a major emphasis on a villain who's never directly represented in the comics, Samuel L. Jackson's The Octopus. Yet there was considerable brilliance in the original strip's directors of photography. Pioneer Will Eisner and his legendary group of collaborators pushed the form forwards in stunning artwork that deserves to be seen by all. 12. 11. This development alone, and the inclusion of the creator in the process, were popularized in the strip's pure serial format. What was The Spirit about? The Spirit was the first superior example of a main character who has things happen to them as much as he makes things happen. Back from the dead, The Spirit is, on the surface, your typical crime-fighting keeper of the peace. 10. Yet the genre-stepping series exulted in making side characters the real protagonists, classic creations like Commissioner Dolan's sassy daughter Ellen, and Spirit's minstrel sidekick, Ebony White. This approach does square with Miller's early conception of the Spirit's harem of women who desire him - he's merely the object of their love. "I wish I had done that differently, because it seems a little unnecessary in places," [Eisner] said. "I think part of it had to do with my own limitations as a writer, because later on I was able to handle it much more gracefully." He added that despite whatever the criticism he's received about Ebony over the years (which actually has not been much) he says he has no regrets over how he chose to treat a minority character as The Spirit' s dependable sidekick. The Spirit was assembled by a team of artists, and when Will Eisner was drafted into World War II, an experience documented in his autobiographical novel The Dreamer, his aides swept in and filled the void. 8. You should hear me and Jules Feiffer going at it in a room. 'No, you designed the splash page for this one, then you wrote the ending — I came up with the idea for the story, and you did it up to this point, then I did the next page and this sequence here and...' And I'll be swearing up and down that he wrote the ending on that one. We never agree. And yet this chaotic system of management produced an irrefutable result. 6. Still, Eisner's focus on the immigrant struggle in what is transparently New York City and his depiction of power therein strikes all the right underdog notes. I'd be shocked if the Frank Miller story touched on any of these themes, but pleasantly surprised if it did. Eisner's grappling with these topics had him focusing on Jewish themed projects like Fagin the Jew and his autobiographical The Dreamer. 5. Above all, the artwork of The Spirit is remarkable in its consistency. Its echoes in the comics that came afterwards are everywhere, and not simply in the distinctive artistic style that brought high art to the funny pages. More than anything else, The Spirit is hysterical, and the humor holds up as well as the artwork. 4. And the artwork does impress. Frank Miller has talked about first being inspired by a panel in which The Spirit walked by the river, mourning the one he loved. One favorite tool that Miller likes to use from Eisner is the contrast between the size of elements. The Spirit was always picked up... 3.